Koss is an unincorporated community in Menominee County, Michigan, United States. Koss is located in Lake Township on the left bank of the Menominee River along S-1 Road, 4.9 miles (7.9 km) west-southwest of Stephenson. Koss was founded in 1893 at the site of a saw and planing mill. It was originally named Fischer, after the Chicago clothing company Kuh, Nathan, and Fischer, which turned the local logging line into a railroad that extended north to Miscauno Island. After it was determined that there was already another Fischer post office in Michigan, the village was renamed Koss after the railroad auditor Otto A. Koss, and George P. Gunderson was appointed as the first postmaster on March 26, 1896. The Wisconsin and Michigan Railroad relocated its business office to Koss in 1897 because of its importance as a lumber town. The town had a population of nearly 2,000 before it was destroyed by a fire in 1900. The town was struck by fires again in 1902, 1908 (destroying 18 homes), and 1930. A stream gauge was established at the Koss Bridge on June 21, 1907. The C. H. Worcester company store, managed by Samuel Mackevich, operated in Koss until 1909. The town went into decline, and the post office was closed on March 31, 1913. Koss was characterized as a ghost town by the 1940s. However, it still supported a small population and logging operations. In the 1940s, the Duffrin mill was sawing 2,000 to 3,000 board feet of lumber a day from deadhead logs harvested from the Menominee River. Direct road access to Koss from Wisconsin was created after the last Wisconsin and Michigan Railroad train ran on June 30, 1938. Marinette and Menominee counties jointly purchased the abandoned railroad bridge south of Koss in July 1938 and converted it to road use. The Koss Bridge connects County Road JJ in Marinette County to S 4 Road in Menominee County. Prior to this, interstate road access to Koss was via a 480-foot steel bridge across the Menominee River west of Wausaukee connecting Pike River Road in Marinette County to Cedar River Road (County Road G 12) in Menominee County; that bridge was destroyed in a 1920 flood when an ice jam broke. The original Koss railroad bridge was built by F. S. Brown & Co. of Chicago in 1894 and was one of the longest Pratt through truss bridges in the region, measuring 388 feet (118 m). It was replaced by a new bridge in 1991. The Koss Bridge has served as the starting point for an annual canoe race held on the Menominee River. Koss Park, a fishing site with a small boat ramp, is located on the Menominee River southeast of Koss. 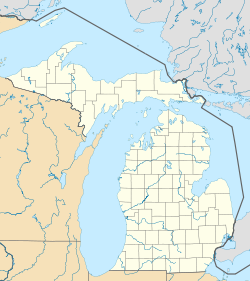 ^ Menominee County (PDF) (Map). Michigan Department of Technology, Management and Budget. 2010. Retrieved September 12, 2014. ^ a b c "Koss Is Ghost Lumber Town". The Escanaba Daily Press. November 15, 1946. p. 6. Retrieved September 12, 2014 – via Newspapers.com. ^ a b c Romig, Walter (1986). Michigan Place Names: The History of the Founding and the Naming of More than Five Thousand Past and Present Michigan Communities. Detroit: Wayne State University Press. p. 309. ^ Amberg, the First 100 Years, 1890–1990. Amberg, WI: Amberg Historical Society. 1990. p. 83. ^ "Forest Fires: They Are Causing Much Damage in Michigan—Village of Koss Burning". Daily News-Democrat. October 9, 1902. p. 4. Retrieved September 13, 2014 – via Newspapers.com. ^ "A Village in Flames". Altoona Tribune. October 9, 1902. p. 1. Retrieved September 13, 2014 – via Newspapers.com. ^ "Twenty-Seven People Perished in Fire Yesterday". Albuquerque Citizen. October 17, 1908. p. 9. Retrieved September 13, 2014 – via Newspapers.com. ^ "Menominee Fire Spans River to Strike Camp". The Courier Express. September 13, 1930. p. 1. Retrieved September 13, 2014 – via Newspapers.com. ^ Smith, Leonard S. (1908). The Water Powers of Wisconsin. Madison: State of Wisconsin. p. 67. ^ a b "Sam Mackevich, 71, Merchant, Retires". The Escanaba Daily Press. February 14, 1947. p. 6. Retrieved September 13, 2014 – via Newspapers.com. ^ a b "Sam Mackevich, 72, Former Bark River Merchant, Is Dead". The Escanaba Daily Press. January 13, 1948. p. 2. Retrieved September 13, 2014 – via Newspapers.com. ^ "Lumber Demand Booms Deadhead Log Fishing". The Escanaba Daily Press. October 9, 1946. p. 8. Retrieved September 13, 2014 – via Newspapers.com. ^ King, Beverly & Deacon, Dan (1987). Faithorn Centennial, 1887–1987. Faithorn, MI: Author. ^ "Bridge is Purchased". Ironwood Daily Globe. July 25, 1938. p. 7. Retrieved September 13, 2014 – via Newspapers.com. ^ "State News: Wausaukee". The Gazette. August 2, 1911. p. 5. Retrieved September 13, 2014 – via Newspapers.com. ^ Standard Atlas of Marinette County, Wisconsin, Including a Plat Book (Map). Geo. A. Ogle & Co. 1912. p. 63. ^ "Ice Jam Breaks; Destruction in Wake of Flood". Oshkosh Daily Northwestern. March 30, 1920. p. 1. Retrieved September 13, 2014 – via Newspapers.com. ^ "Inspect Damaged Bridges". The Capital Times. May 7, 1920. p. 10. Retrieved September 13, 2014 – via Newspapers.com. ^ Ebsch, Larry (August 2, 2010). "Can You Canoe? Canoe Origin Unclear, Still Enjoyed at Championship". Marinette-Menominee Eagle Herald. p. 7. ^ Land Atlas and Plat Book, Menominee County, Michigan (Map). Rockford Map Publishers. 1993. p. 18. Library of Congress. Photos of the Koss Bridge. This page was last edited on 24 February 2019, at 22:15 (UTC).